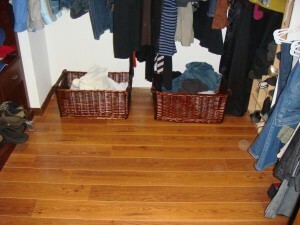 A typical closet floor for us. Now, even with all those beautiful plastic, white, matching hangers I bought – we still end up with clothes on the floor (and ski goggles?) So since I (try to) do laundry in colors and whites, I thought I would buy two baskets to sort the clothes. I like baskets. And there are many places to get baskets but I love the ones at World Market. I found these,(took out the linens) with handles so when they are full I just carry them to the washer and after the clothes are dry, fold them, place them back in the same basket and carry them back to the closet. My other secret weapon is my make shift laundry basket off our kitchen. 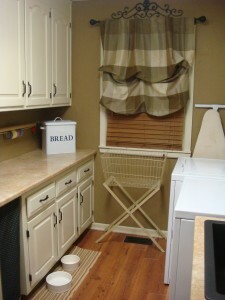 It also had a linen liner that I took off and now just shoot clothes baskets into it from my kitchen. Very handy. Okay, that is too funny. Can you believe that that song has caught on like it has? Why can’t you put them pants in the baskets? LOL! 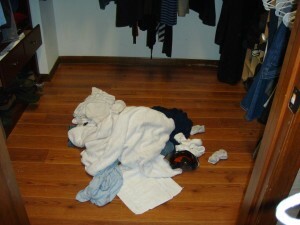 Glad to see that other people have issues opening the hamper to throw dirty clothes in! Thought I was the only one! We have a similar basket system, only my baskets aren’t pretty like yours. 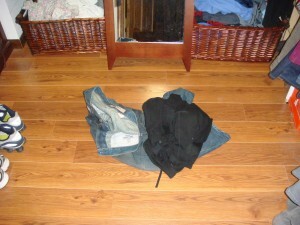 Perhaps if they were, the clothes would be more likely to actually end up there. I love your AI references. Too funny with your reference, Katie! Great suggestions, too! World Market is my go-to for baskets! Love the baskets! And your big closet!